Description: Find out how simple it is to do several new stitches, just from small modifications to the Oslo stitch. Different stitches give you more options in elasticity and density. Naalbinding needle provided. 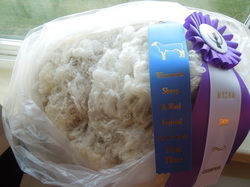 Stephanie Anderson of Northern Woolen Mills has generously donated white or colored fleece to any 4H member who does not have sheep or fleece but would like to learn more about fleece by entering the fleece show. To reserve your fleece, please contact the festival. Thank you Stephanie! ​To enter a fleece, bring your fleece and $2 to the festival. You will fill out a card with your name and contact information and information about fleece you are entering. Description: In this class, you will go through the steps to becoming your own mitten designer. You’ll turn your hand measurements into a custom mitten chart for the gauge** you want. We’ll discuss cuffs, mitten shaping and thumb options. Then, you will create a color work pattern on your chart and we will discuss tips for designing patterns that are easy to knit and look good too. At the end of class, you should have a good start on your own custom pattern as well as the skills to create more patterns for yourself and others. **Homework: Please knit a swatch in the yarn you would like to knit your mittens in and measure it for gauge. For best results, do a simple color work swatch in the round. Please email the instructor at jcraftyenough@gmail.com one week before the class with your gauge so she can provide you with the correct knitting graph paper. Experience required: We will not be knitting in the class but advanced beginner to intermediate knitters with some experience reading knitting charts will get the most out of this class. Materials Fee and what the fee includes: $5 printed instructions, worksheets and custom knitting graph paper as well as a memory stick with blank worksheets for future use. Description: Use wool fibers to create a branching pattern on felt, then add in petals and leaves for your own touch of spring.